If you live in the Great Plains or anywhere in the Pacific Northwest, you probably are quite familiar with Chinook winds. Also known as a Foehn – or Fohn wind – Chinooks are a type of dry, warm winter wind that commonly occurs on the downslope, or lee side, of a mountain. A Chinook wind occurs when warm air that has lost most of its moisture on the windward side of a slope slides down the leeward side. #1 – Chinook refers to a type of people. However, in relation to Chinook winds, the term actually refers to the Native American tribe that originally lived in the region where Chinook winds develop in the United States and Canada. #2 – Chinook winds can start an Alberta clipper. When Chinook winds descend upon the Canadian prairies and get stirred up with a cold air mass, the result can be an Alberta clipper. These fast-moving winter storms sweep across the upper Midwest portions of the United States and can explode into a full-on Nor’easter once the storm reaches the Atlantic waters. #3 – Chinooks can cause temperatures to rise like a hot air balloon. You may be shocked at just how quickly temperatures can rise once a Chinook settles in. The fastest warm up on record as a result of a Chinook occurred in Loma, Montana, on January 15, 1972, when the temperature rose from a bone-chilling -54 degrees Fahrenheit to a relatively balmy 48 degrees within 24 hours. These rapid warm spells can melt ice at a rate of up to 1 inch per hour and turn inches of snow into puddles of water in a rapid period of time. #4 – Chinook winds are most common in Canada. Chinooks can occur on the lee side of any mountain range but are most commonly associated with southern Alberta. They are especially prevalent in the region between Pincher Creek and Crowsnest Pass into Lethbridge. These are areas that generally experience about 35 Chinooks each year. Chinooks can occur farther south and north, but are less common in those locations. #5 – Chinook winds can be as strong as hurricanes. A Chinook may gust up to 75 mph winds. The record wind gust from a Chinook was recorded at 106 mph, which is the same as a Category 2 hurricane! #6 – Chinooks can cause unusually high winter temperatures. One of the highest February temperatures ever recorded in Canada came in Claresholm, Alberta in 1992, when the temperatures hit an impressive 75 degrees Fahrenheit. #7 – Chinook winds create amazing clouds. The Chinook arch is a stationary stratus cloud deck that is created by air rippling over a mountain. The clouds may looks ominous, but they don’t usually cause stormy conditions, and they can actually help produce some pretty amazing sunrises and sunsets. Chinook arch clouds generally change in color during the day and can exhibit colors ranging from yellow and orange to red and pink in the morning. 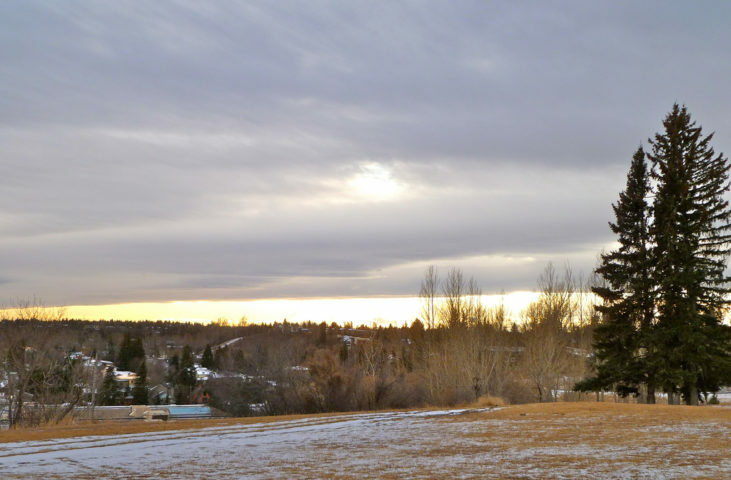 A Chinook arch can turn grey during the afternoon before returning to the red and pink then yellow and orange shades as the sun falls toward the horizon.